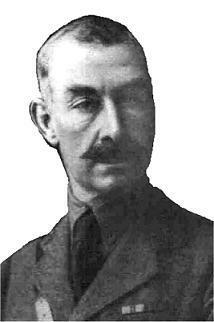 Commanded the 6th Battalion Worcestershire Regiment from 1911 to September 1916. Ferdinando Dudley William Lea-Smith was born on the 4th April 1872 at The Grange, Halesowen, son of Major Ferdinando Dudley Lea-Smith and Amy Sophia Leigh. Ferdinando Dudley William Lea-Smith has a long family connection with the military in Worcester. His father Major Ferdinando Dudley Lea-Smith had been commissioned as a Lieutentant in to the Queens's Own Worcestershire Regiment of Yeomanry Cavalary and later as a Captain and then Major with the 6th Company of the Worcestershire Volunteer Rifle Corps. He was also appointed Sheriff of Worcester for the year 1860. Ferdinando Dudley William Lea-Smith's, grandfather was Lieut.-Colonel Ferdinando Smith, commandant of the City of Worcester Militia in 1808. So it was with these family connections with the Worcester Military that Ferdinando Dudley William Lea-Smith joined the Worcester Militia and then in 1908 the 6th (Special Reserve) Battalion Worcestershire Regiment with the rank of Captain. On the 3rd February 1904 he married Sybil Augusta Coventry, daughter of Reverend Henry William Coventry and Leila Louisa Colquitt-Craven. In 1911 he was appointed to command the 6th Battalion Worcestershire Regiment, which he continued to command until September 1916. Ferdinando Dudley William Lea-Smith, gained the title of 12th Baron Dudley and entered the House of Lords on the 9th May 1916. He died on the 5th December 1936 at age 64.